Artisan, independent, French with a multicultural twist! Gatineau is the place for the best fresh handmade cakes, breads, biscuits, macarons, chocolates, quiches and viennoiserie in town. All our products are made in our Summertown shop and Kidlington Production Kitchen using only high-quality ingredients including flour, butter, cream and chocolate brought directly from France to ensure authenticity in all that we do. From buttery croissants to crusty baguettes, delicious and beautiful French mousse cakes to a variety of macarons, we have everything you need to make your breakfast, lunch, break, and celebrations very special and enjoyable. Most of our products are available to have in or take away. We serve locally roasted Missing Bean Coffee and sensational French Palais des Thés teas. 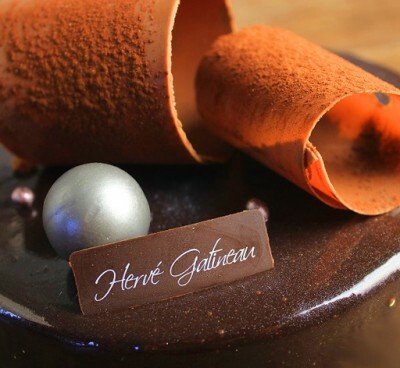 Gatineau offers a range of special items for the Christmas season, such as the Bûche de Noël – a traditional French Christmas cake designed in the shape of a yule log – and the Galette de Rois which is traditionally eaten in January. We also offer macaron hearts and specially packaged chocolates for Valentine's Day, as well as beautifully hand-decorated and filled chocolate eggs for Easter. We make wedding cakes in a variety of sizes as well as traditional French croquembouche and macaron towers. We can also provide a selection of sweet petit fours to accompany your champagne reception. Please enquire for further information about taster sessions, colour themes and delivery service. And whether you are celebrating a birthday, anniversary, Christening or some other important occasion, we are happy to personalise your cake with a small message and make larger versions of our range of cakes as well. Gatineau also provides a wholesale service catering to places such as The Grand Café, University College Oxford, Keble College, Branca Deli, The Swan Restaurant, Ratio, Brew, Society Café, Colombia Coffee Roasters, The Missing Bean, Barefoot Kitchen and many others. Please contact us for further information.